Review: The Dark Knight Rises – Geek Girls Rule!!! If you thought filmmaker Christopher Nolan couldn’t best The Dark Knight, you were wrong. Eight years after the events of The Dark Knight, Bruce Wayne (Christian Bale) is retired as Batman and lives as a recluse. When a new reign of terror is brought to Gotham City by the relentless Bane (Tom Hardy), Wayne must once again become Batman to save his city, aided by cat burglar Selina Kyle (Anne Hathaway), Commissioner Gordon (Gary Oldman), and rookie cop John Blake (Joseph Gordon-Levitt). Director Christopher Nolan (Batman Begins, The Prestige, The Dark Knight, Inception) had a monumental task set before him. How to complete his Batman trilogy with the brilliant shadow of The Dark Knight looming over him. Challenge accepted and met, and the finished work is an unforgettable superhero epic. Larger in scale than the previous films, but still gritty and character driven. The action scenes are both bigger and tighter than before. His choice casting yields great results. This is Nolan at the top of his game, and this is also the superhero genre at the top of its game. In the wake of Joss Whedon’s The Avengers raising the bar for the genre, now Nolan’s film two months later raises it yet again. The screenplay by Nolan and his brother Jonathan (The Prestige, The Dark Knight), based on a story by Nolan and David S. Goyer (Batman Begins, The Dark Knight, the upcoming Man of Steel), takes elements of comic book storylines from 1993’s “Knightfall” to 1999’s “No Man’s Land” as inspiration for an epic story about the fall and rise of both the titular hero and the city he protects. What does Bruce Wayne really want, can he come back from a crushing defeat, and can he finally lay his inner demons to rest? These are some of the question explored, and the answers reach back to Batman Begins, taking the audience full circle with the hero on his emotional journey. Despite the dark themes of the trilogy, it ends on several notes of hope, lights at the end of a dark tunnel. There are some political overtones to the story as it plays out a theme of an uprising against the rich. It’s been accused of being anti-Occupy and pro-Occupy, but the truth is it’s neither. The story was conceived two years before the Occupy Movement began, and it started filming months before. Late in the shooting schedule, Nolan decided to film some Occupy-themed material, but chose to leave it out of the film. The theme I see is actually a cautionary one about populist manipulation of causes for someone else’s benefit. The contributions of Nolan’s usual collaborators–cinematographer Wally Pfister, production designer Nathan Crowley, and costume designer Lindy Hemmings–are once again top quality. Nolan’s Batman universe is a gritty, practical one, favoring stylized realism over stylized fantasy. A real world aesthetic is expressed in sets and costumes. Nolan also rejects digital cinematography, and 35mm, 65mm, and IMAX cameras were used to shoot this film on location in Pennsylvania, New Jersey, New York, California, England, Scotland, Romania, and India, resulting in sharp, clear images with the organic qualities film provides. Oscar-winning composer Hans Zimmer (The Lion King), who scored the previous two Batman films with James Newton Howard, works solo this time, but his score is a strong companion to the story. The visual effects are seamless. Christian Bale is an important asset once again as he takes his character on the completion of an emotional journey that started in Batman Begins. In this film, he’s older, more emotionally damaged, and also physically damaged. Tom Hardy delivers a dominant and chilling performance as Bane, giving him a sharp intelligence in contrast to his brawler’s physique. It’s not quite on the same level as Heath Ledger’s brilliant Joker, however it’s still a compelling performance rendered through body language and the richness of his voice. Anne Hathaway is a good choice for the conflicted cat burglar Selina Kyle, the character most know as Catwoman. Joseph Gordon-Levitt makes his presence felt as the rookie cop who becomes a key ally for Batman. Michael Caine returns as Bruce Wayne’s butler and father figure Alfred Pennyworth with some bravura acting. His role is small but vital, and adds another emotional layer to the story, heartbreaking at times. Gary Oldman gives a fine performance as an older Commissioner Gordon, haunted by the choices made in The Dark Knight to preserve the legacy of Harvey Dent. Morgan Freeman’s Lucius Fox remains a pillar of support for Bruce Wayne and Batman, and as he usually does, brings warmth and humor to a role. One of Christopher Nolan’s strengths as a director is in casting the right actors, which here includes Oscar-winner Marion Cotillard (La Vie en Rose) as Miranda Tate, a member of the Wayne Enterprises board of directors who positions herself to be an important ally for Bruce Wayne; Nestor Carbonell as Gotham City Mayor Garcia; Israeli actor Alon Abutbul as a nuclear physicist working for Bane; Juno Temple as Selina’s accomplice and friend Holly Robinson; Matthew Modine as Deputy Commissioner Foley; Ben Mendelsohn as Bruce Wayne’s business rival John Daggett; former Torchwood actor Burn Gorman as Daggett’s right hand man Stryver; and Tom Conti as a prisoner who aids Bruce Wayne. There are a couple of performers I won’t mention to avoid spoiling some surprises. 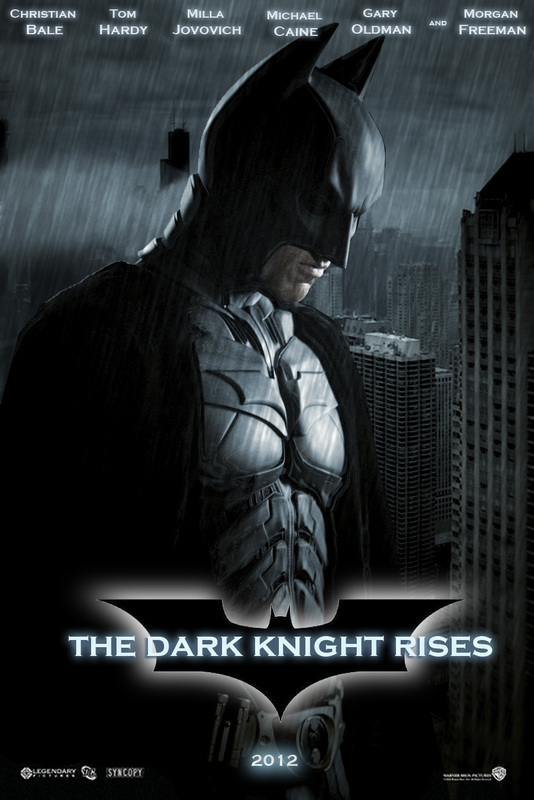 The Dark Knight Rises brings Christopher Nolan’s Batman trilogy to a triumphant finish. Finally, a superhero film series has avoided the infamous “third film” curse. Nolan leaves behind a strong legacy of excellence that has set a new standard. Where does the Batman franchise go from here? There will no doubt be a reboot of the franchise in a few years, allowing another filmmaker and actor to create their own interpretation. As this film reminds us, Batman is an idea larger than one person. Highly recommended. “Michael Caine returns as Bruce Wayne’s butler and father figure Alfred Pennyworth with some bravura acting. His role is small but vital, and adds another emotional layer to the story, heartbreaking at times”. It takes a LOT to make me cry. Two of his scenes had me in tears. Go, Alfred! !